The story of "the little park that could" at the corner of Reed & Commonwealth Avenues continues to unfold. Park construction will occur from June 12 -October 30, 2018. The parks department will hold a Pre-Construction meeting on June 7th, 7:00pm at the park. City staff will provide information about scope of the project, construction activities, and to respond to any questions. In the event of inclement weather, the meeting will be held at Leonard 'Chick' Armstrong Recreation Center, 25 West Reed Avenue. The 0.58 acre site had previously been a dormant substation. 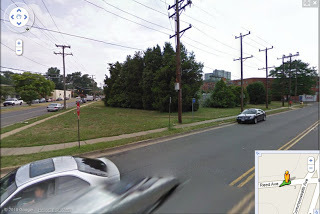 The City’s purchase of the property in 2009 required that Virginia Electric Power Company demolish and remove the substation and complete all necessary environmental remediation. 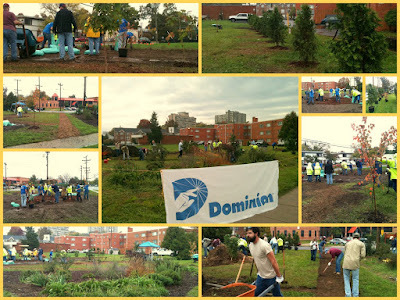 In October 2011, neighborhood volunteers used donated plants and mulch to install two gardens, a walking path, shade trees and park benches. In 2016, the City completed the Neighborhood Parks Improvement Plan that included a concept for the park, building upon the volunteer efforts, with a plaza and game tables, a tricycle track and picnic area. Last September, Rebuilding Together Alexandria hired Landscape Architecture firm Rhodeside and Harwell to develop a design for the site, based on the Neighborhood Parks Improvement Plan. Rhodeside and Harwell, RPCA, and Rebuilding Together Alexandria held a community meeting on October 11, 2017 to present a draft concept for the park, as shown in this presentation. The project team will present the final site design at the Park and Recreation Commission meeting on January 18, 2018. Neighborhood volunteers teamed with City staff to forge ahead even in the face of economic troubles and budget crises. For just $200 it started to resemble a park, using only cast-off garden plants donated by neighbors and mulch ground up from cut-down, unhealthy, storm-battered trees formerly used to screen the old substation. For regular readers of The Arlandrian this is not news. We documented the progress along the way with our stories: "Where Did THAT Garden Come From? ", "New Park Uncovered At Spring for Alexandria"and "How does our garden grow?". The tale of a community coming together is something that we are really amazed by and, frankly, more than a little proud. 2011's work by Dominion Power crews. The City also matched the Dominion dollar contribution with additional plantings. All in all, 4 new maples, 3 crepe myrtles, and 12 arborvitae have now made the community gardening project into a bona fide pocket park. Work by the Cora Kelly students and City staff continued this in the spirit of community pride that has built this park. In June 2012, Students from the Cora Kelly School for Math Science & Technology spent a Wednesday morning fixing up the gardens planted over the past several years. Three new trees were added as well. 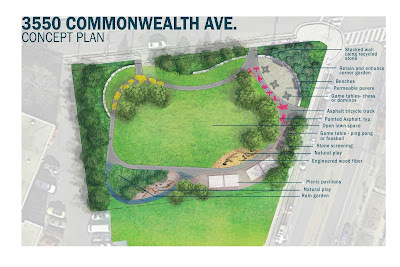 Still a work in progress, a story that is still unfolding, the Reed Avenue Park at 3550 Commonwealth Avenue is an incredible neighborhood accomplishment that continues to grow. Thanks to diligent work by City staff and the help of Rebuilding Together Alexandria, the next step in the journey of this little park from substation to open space continues; a community effort on Commonwealth Avenue for the common good.